Former orca whale trainer John Hargrove visited "The Daily Show" on Thursday night, telling host Jon Stewart that SeaWorld has a "cult-like mentality." "Morally and ethically, this is just not right," the 12-year SeaWorld veteran said. Stewart asked if it was at all possible to keep orca whales "in a humane way" - and Hargrove promptly said, "It's not." "We have an overwhelming amount of signs that prove that these animals are not only not thriving - they're not surviving." 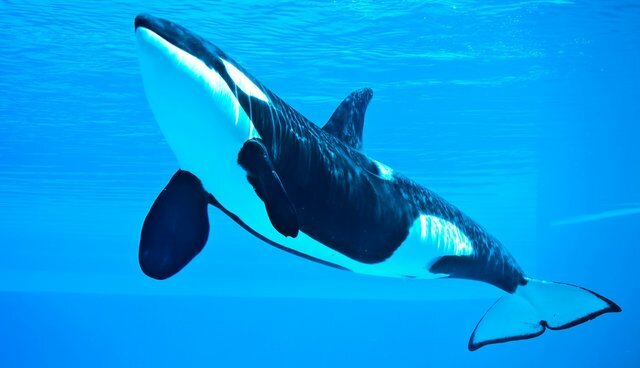 When discussing SeaWorld's practice of separating orca mothers from their calves, Hargrove called it "horrible" and said that he knew of at least 19 mother-calf pairs the park had separated. He pointed out that SeaWorld uses "propaganda" to insist they don't separate calves - and where they make the claim on their website, they show a photo of a separated mother whale and her calf. "They are so stupid that they couldn't use a picture where the two whales are actually together," he said. Takara lives at SeaWorld San Antonio, while her calf Kohana is now on loan to a marine park in Spain. See Hargrove explain why he finally felt "disgusted" enough to leave SeaWorld here.